The local farmers markets and our own vegetable gardens are certain to be kicking out some fresh greens soon. Spring and early summer is the time when you see the highest quality of locally grown salad blends available in New England. 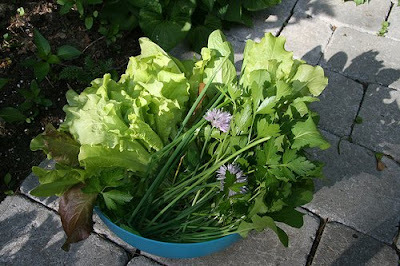 Arugula and Boston lettuce, two of my favorites are a delectable combination of tangy greens. Vinaigrettes can make this blend of greens pop with tang and spice. Here is a zippy homemade dressing to bring all the flavors together. A few basic ingredients from the kitchen pantry create a simple dressing with none of the preservatives or additives. It is much healthier to make your own vinaigrettes and tastier by far. This is also where you can play with the flavors to bring out the peppery taste of the Arugula and the sweetness of the Boston lettuce. Sow those seeds and get ready for the greens! We end with Oscar Wilde’s inspirational thought regarding what make those greens great. “To make a good salad is to be a brilliant diplomatist -- the problem is entirely the same in both cases. To know exactly how much oil one must put with one's vinegar.” Always taste your dressing with a leaf of lettuce to make sure you get it just right!